Currently the forum is filled with people asking for hints, test-cases and what not . This happens during every Long Contest. I think people below a certain karma should not be allowed to post during this time. The best thing i know is to report such questions at feedback@codechef.com. Also do not attempt to answer those questions. I am agree with @avastpulkit that there should be some restriction for posting a question in forum during live contest.may be same as it should first go to admin for verification like comments goes for approving during contest. but this is also possible that new programmer really feels some problem to understand the problem statement,test cases,constraints,input output format,they might have tried to post a comment in question itself to clarify a test cases ,clarify a problems sub statement but it would not have posted in problem (admin disapprove that comment). and i think this is problem setter’s responsibility to clarify this dough’s, and explanation of sample test cases and this is not violation of codechef code of conduct. So one have to think the logic to solve the problem. It depends on the type of question. The clarifications to a problem statement can definitely be answered keeping in mind not to reveal any hints to the solution of the problem. Moreover I agree that asking hints for the solution is not good and should not be allowed. tags are added by the person asking asking the question, so you cannot control the tags. Reporting each question to the codechef team is kind of an overkill. This needs to stay at the top till the contest ends. no I don’t feel anything like this is required. It is almost round the month, that one or other contest is going on. So, if there is a new person, who have doubt should wait for a month to find when he/she can post their doubts ?? http://discuss.codechef.com/questions/42104/little-elephant-and-balloons , fully fledged discussion with upvotes , even an accepted answer…!! 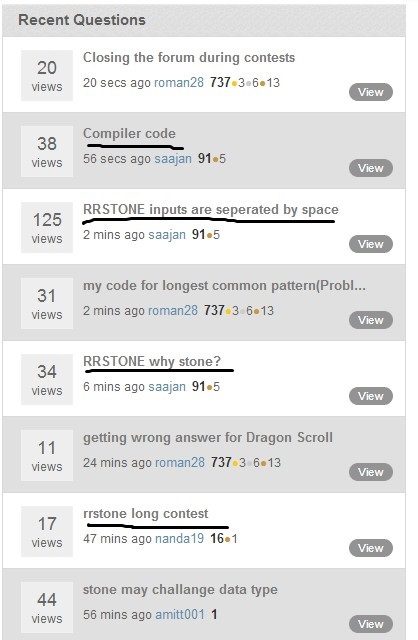 To eradicate this problem just closing forum wouldn’t help, because one can ask at other place too like stack overflow, etc. There would be hundreds of links where people has asked questions on ongoing contests. It is impossible to close every forum. Rather, members should themselves, shouldn’t involve in doing cheating in any way. Code Chef as far as I know already take strict actions which include disabling of accounts of people associated with cheating. Rest it use MOSS to check for plagiarism.